Christmas Catalogue reviews about toys, gifts, clothing, electronics and numerous products that are featured in the catalogues. Each year the best sales at Christmas are released by catalogues. In Australia two most anticipated sales of popular stores are Toy Sale and Christmas sales. Last three weeks of December are the times integrated with Christmas catalogues and online deals of these stores. 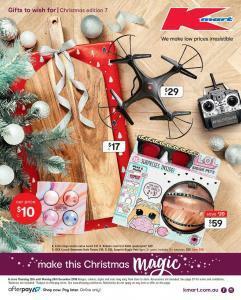 Target, Kmart, Toys R Us, Myer, Big W and other stores which offer toys, apparels, technology, entertainment and similar kind of non-food items generally make weekly or daily catalogues for Christmas. After Christmas gift sales, Boxing Day sales or Stocktake sales will be launched. If you follow the posts of this category, I believe you will profit a lot out of this shopping for gifts. Find the latest Christmas catalogues of toys, food, decor, gifts, entertainment and more from top stores. Below you can find currently available Christmas Catalogues published so far. Great products of collectable toys are on pg 8-9 of this Kmart Catalogue. Christmas toy sales are always interesting discounts. One of the most popular toys are those of Hatchimals. Hatchibabies cheetree will cost only $49 at Kmart Catalogue this week. LEGO Storage head, Assorted Pikmi pops jumbo pack, Ballerina dreamer ballet set and more are also on these pages. LEGO sets are also on sale at Kmart Christmas shelves. Find LEGO Friends, Duplo, City, Ninjago on pg 10. Exclusive toys to Kmart are available in this catalogue. One of the toys that are only at Kmart is Wiggles stage microphone. It's only $18 until 24 December. Play-Doh, Imaginext and more toys are on pg 11. Don't forget the board games. Our favourite ones like Monopoly, Life, Soggy Doggy, Twister, and more exclusive ones are the featured items on pg 12. Pay lower for Shimmer N' Sparkle sequin flip accessories. Some of these are also only at Kmart. The catalogue also has RC vehicles like wi-fi video capture quadcopters, and construction toys on pg 15. NERF blasters and X-shot are also on this page. Find Christmas festive foods, party platters, and all the ingredients for you to prepare it yourself. Deli products are delicious. You have snacks, pepper, cheese, and more products on pg 14-15. More foods are available on 22 December and everyday. Go to pg 18-19 for every day products at Aldi catalogue. Marinated lamb leg steaks, boneless butterflied chicken, Ocean Royale frozen wild raw peeled prawns, smoked salmon, and more products are also the featured products in everyday sale. Check out outdoor furnitures like sun lounger, ice cube cooler, rolling cooler, double hammock, and portable charcoal BBQ. All the things to enjoy the summer in your backyard. This type of Aldi Special Buys are my favorites because of the surprises and additional savings like those everyday products. Find more products on pg 21-22. Follow our Facebook page to track the future deals and new catalogues of Aldi. Other categories to find in the catalogue are outdoor furniture, kitchen ware, kitchen appliances, swimwear, and garden games. Browse the new Kmart Catalogue Christmas sale for treats consisting of the best candies of the favourite brands like Cadbury, Lindt chocolate boxes, tin and toys. The toy sale is again fascinating and full of surprises. Monopoly, Soggy Doggy, Bingo and more board games are also on sale at Kmart. Browse RC control toys on pg 14. It's a great sale with combination of joyful options from many different categories. Christmas holiday will be so relaxing and joyful with such happy prices and traditions this year. The first 6 pages of the catalogue are about the deals on Christmas treats. Cadbury products, Christmas hampers, decorative sweets and chocolate boxes are also perfect gifts. They are always better every year with a new design. My favourite product from this catalogue is Belgian Chocolate gift tins of 450g which is only at Kmart. Lindt prestige selection, Darrell Lea Christmas tin, Cadbury Roses tin and many more products are in this part of the catalogue. Some of them are available in store only. Powerful deals of Target has been enhanced. Improve your skills of saving with the digital catalogues, particularly in this time of the year. Christmas sales are the best in Australia. Also, remember to check out this page on boxing day. Merry Christmas. 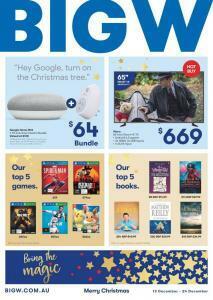 Target Catalogue Christmas Clothing Sale 18 - 24 Dec is one of the best things in that catalogue. High-quality ladies' sleepwear is a great part of it. Find it on pg 15. Gifts under $15 can be helpful if you are seeking one. Classy personal care gifts are also on the same page. Visit pg 16&17 for casual dresses and clothing. Sandals, drawstring dress, courtney shirt, boyfriend shorts and more stylish clothing for ladies. The most expensive clothing there is $39. So, that's basically gifts under $40. Also, Harry Potter clothing for kids can be found on the catalogue. See the deals on bodysuits, romper with bib and more on pg 19. Gift boxes of Christmas treats, popular chocolate brands including Toblerone and Cadbury, and even Turkish delight are available on pg 2-3 of Target Catalogue Christmas. New product is available; 28 piece fruit-shaped jellies gift box and Turkish delight gift box. These gifts are just like Harry Potter's snacks. They look cool and smells like Christmas. Find Star Wars LEGO sets on pg 4. Creator, Ninjago, Friends, City and Star Wars sets are on sale. Board games including Monopoly, Operation, Guess Who? and more games, which will bring everyone together, are only $25 each. Find Fisher-Price, Batman, Harry Potter, Pj Masks and more on pg 6. Target has costumes of Batman and more characters and each will cost only $25. Collectable and cute toys like Beanie Boots, Zoomer, Fingerlings, Little Live Pets are on pg 7. Marvel's superheroes have always a corner in a toy sale catalogue published by Target and like-class stores here. Transformers and more heroes can be seen on pg 8 of the catalogue. Nerf blasters and bikes with exclusive offers are the featured items on pg 9.